Western Cordura / Leather Synthetic Saddle. Comes complete with ferrules, headstall, reins and breast collar. STYLE: Barrel Race, pleasure and trail. Weight Appox. 18 lbs. Western Cordura Synthetic Saddle. 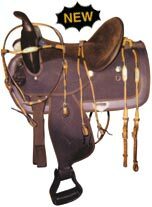 Comes complete with ferrules, headstall, reins and breast collar. FIVE Year Guarantee SEAT: 15" or 16"
STYLE: Pleasure - Weight approx. 18 lbs. 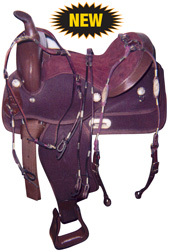 Made in the U.S.A.
FIVE Year Guarantee SEAT: 13" or 14"
Western Navajo Synthetic Saddle. 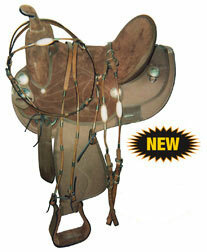 Comes complete with ferrules, headstall, reins and breast collar.